St. Mary's rapid is accessible from the Canadian side only and offers a great on or off shore fishing opportunities. 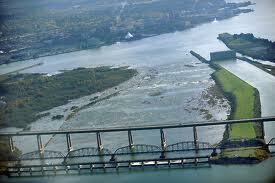 The rapid represent a short stretch of the St. Mary's river which drains Lake Superior into Lake Huron. It's approximately 2/3 of a mile long by 1/4 of a mile wide flowing over a substance of bedrock (sandstone), boulder, rubble, gravel and sand. The rapids support annual runs of Steelhead, Atlantic Salmon, Chinook and Pink Salmon as well as a resident population of Rainbow Trout, Brown Trout and Whitefish. In early September, the Salmon run started. I had heard from other fishermen about the legendary salmon fishing in the area. One elderly man boasted catching a 46" long and 44+ pounds Chinook salmon from the fishing platform on the boardwalk by the waterfront. It sounded like a dream. I tried to feel how wonderful it must have had felt holding that astounding catch. While it was not unusual to catch very large salmon from a boat, reeling something of that size from onshore was enviable. Soon enough I found out it wasn’t easy to find a spot on the fishing platform, not during the salmon run. Fishermen from all over the area came here during this time, some even stayed overnight in the local hotels and motels. The round platform could hold only about a dozen fishermen standing about five-six feet apart from each other. The rest had to move down to other parts of the rapid and try casting either from the boardwalk or from the river side – which required climbing down about six-seven feet. The best fishing spot was the platform, undoubtedly. The idea was to caste in the direction of the current and allow the water to carry the lure down the rapid. Once the lure was set in a nice location one could park the pole inside one of the metal poll holders adjacent to the railing that guarded the platform. Owing to the forceful current the string build up a tension on the pole. The moment a fish bit a lure it would pull hard to get free and the tip of the poll would visibly shake. This was when the fisherman would pick up the poll and reel the catch close enough so that a suspended net could be used to bring the fish up to the platform from the water surface almost ten feet below. Usually there would be somebody who wouldn’t mind giving a hand. After several days of failed attempt one day I finally secured a place in the coveted platform. The first few casting didn’t go very well. I ended up tangling with my neighbors. Apologies were issued, lessons learned. Next I got into a snag and lost my expensive lure. More lessons learned. At the end it turned out to be a disheartening day. I went back home depressed. Weeks later, after losing more lures and breaking couple of poles, finally the goddess of fish blessed me with a large salmon. The experience was overwhelming. I brought it home and measured it and took snapshots with my son Zakeem standing beside it. It was a 42” giant and taller than Zakeem. The picture created quite a bit of commotion among my family and friends and established me as a reputed fisherman. Later in that season I caught three more large Chinook salmon, one steelhead and a large rainbow trout. Finally I was starting to enjoy the Soo way-of-life.